Not a single destroyed house has been rebuilt and at least 100,000 people remain displaced. 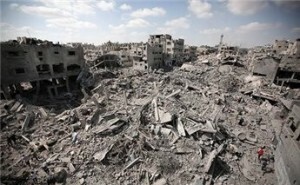 Al Shujaiya neighborhood in Gaza which was destroyed by Israeli air-land attacks. One year on since a temporary ceasefire brought a halt to 50 days of conflict in Gaza, CAFOD is asking for an urgent review of the failed Gaza Reconstruction Mechanism. Last summer’s conflict destroyed 18,000 houses and drove more than half a million people from their homes, according to the United Nations. The Gaza Reconstruction Mechanism (GRM), a temporary agreement between the Palestinian Authority and Israel, was intended to facilitate the import of essential construction materials into the territory following the ceasefire. By July 2015, however, not a single destroyed house had been rebuilt and at least 100,000 people remain displaced. The GRM is clearly not fit for purpose, and CAFOD is calling on Catholics in England and Wales to ask for an urgent review. CAFOD’s new action, launched on the anniversary of the ceasefire on 26 August, invites the agency’s supporters to write to their MPs urging that the British government calls for an immediate international review of the GRM. It follows a CAFOD campaign last summer when 25,000 CAFOD supporters in over 300 parishes signed a petition to the British Foreign Secretary, Philip Hammond, deploring violence and calling for a lasting ceasefire and humanitarian access to Gaza. The petition also called for long-term measures to address the root causes of the conflict and to build a just and lasting peace. Shadi El Quarra, a 25-year-old graduate, lost his home when it was bombed during last year’s war. One year on, he and his family are living in a temporary wooden shelter in front of the rubble, with nine people sharing a small space. “Since the war, we struggle to meet our basic needs. We can barely get food, clothes and medicine… I would ask people in England and Wales to help end the closure – this is the only way for construction to go ahead,” he explained. Cardinal Vincent Nichols of Westminster visited Gaza in late 2014. He said that he was “deeply shocked by the effects of war and endemic poverty” and concerned about “the innocent citizens of Gaza caught in a vice of conflicting ideologies – an almost impossible situation for them”. He called for a political solution to the long-running crisis. As well as joining CAFOD’s Gaza action last year, Catholics in England and Wales donated more than £450,000 to its Gaza Crisis appeal, enabling the agency and its partners to provide aid to thousands of people in need.